I am a big fan of the Chicago “L” system and found part 4 of From Garfield “L” To Congress Median via a link from Chicagobus.org. I LOVE this stuff, especially the old pictures. Is there anywhere I can see the 3 previous parts? I would very gladly become a CERA member if necessary. Thanks for writing. We always hope people will enjoy the posts, and naturally, we encourage everyone to join CERA. You can purchase a membership online, by mail, or at one of our 10 yearly program meetings. For more information, go here. We thank you for your support. 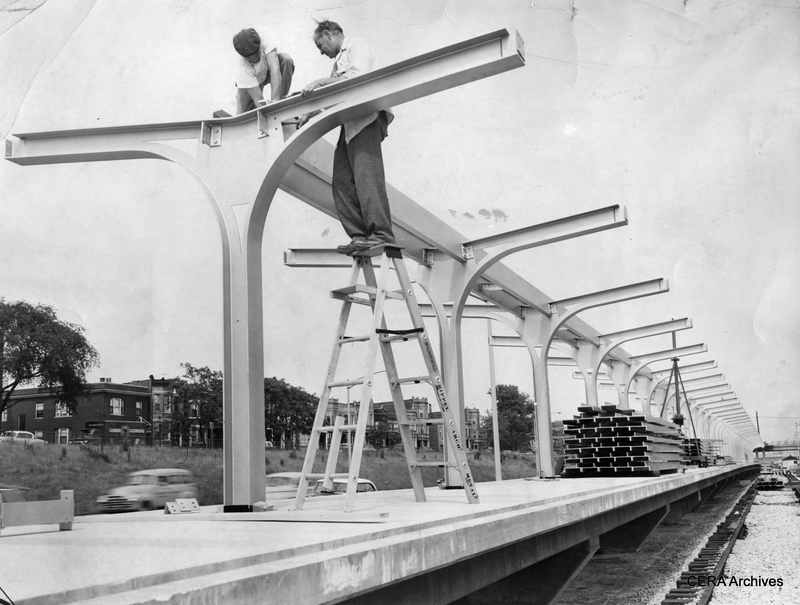 To find all our blog posts that feature the Garfield Park “L”, just go to our home page and type “Garfield” in the search window. That will bring up all the other posts, which have various headline titles. Meanwhile, here is another generous helping of period photos for your enjoyment. Cowles Communications, Inc., transferred all of its copyrights in the LOOK Magazine Photograph Collection to the United States, but asked that the Library convey Cowles’ desire that the photographs are “Not to be used for advertising or trade purposes.” The Library cannot provide further interpretation of this phrase. We are certain that our use of the photo complies with Cowles Communications’ intentions. 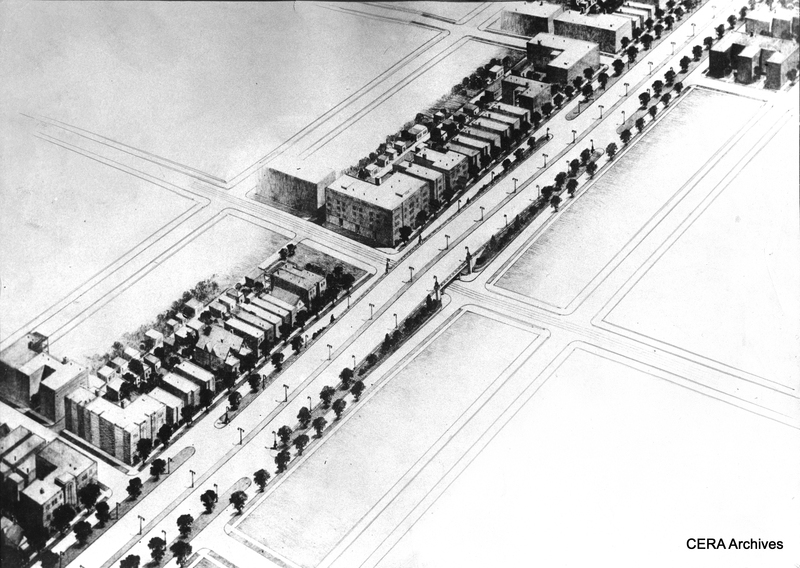 This early highway plan is somewhere between what actually got built, and the original boulevard in Daniel Burnham’s 1909 Plan of Chicago. 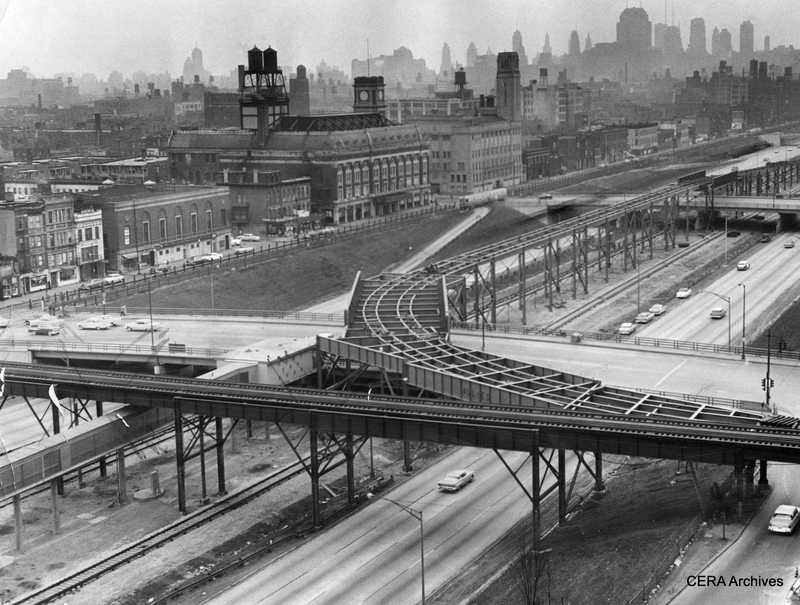 The 1938 version was an elevated highway, which would pass over intersections. 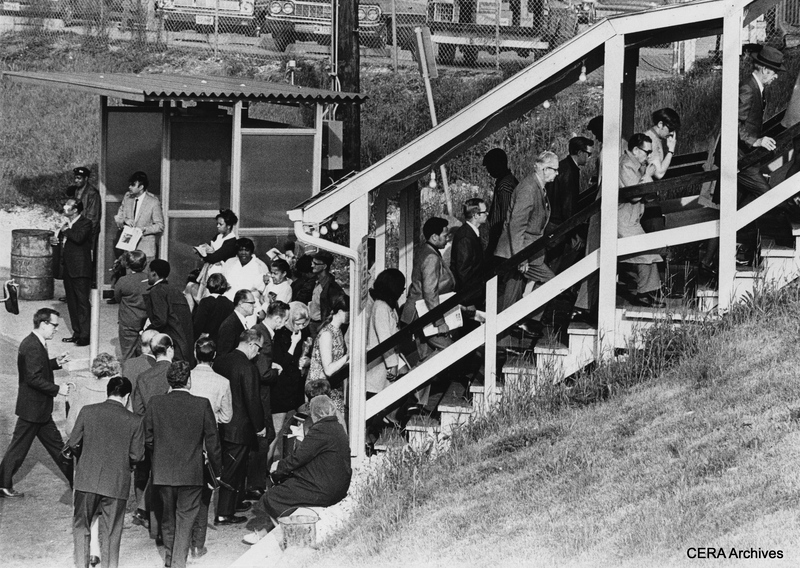 There is no trace of a rapid transit median, and the Kelly administration favored express bus service instead. 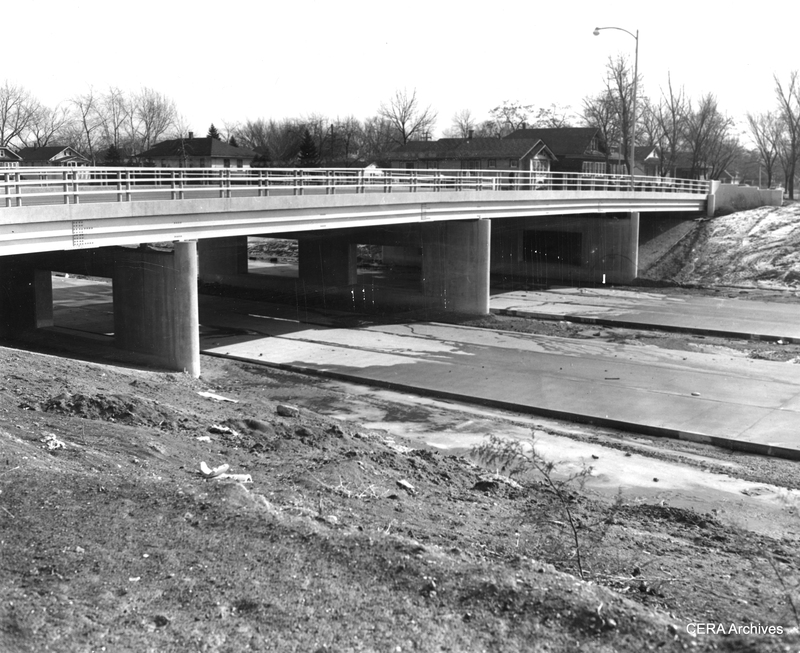 As built, very little of the Congress expressway was elevated. Oddly enough, in this highway illustration, there are very few autos. In real life, the expressway soon became clogged with cars, and rush-hour gridlock soon became an everyday occurrence. 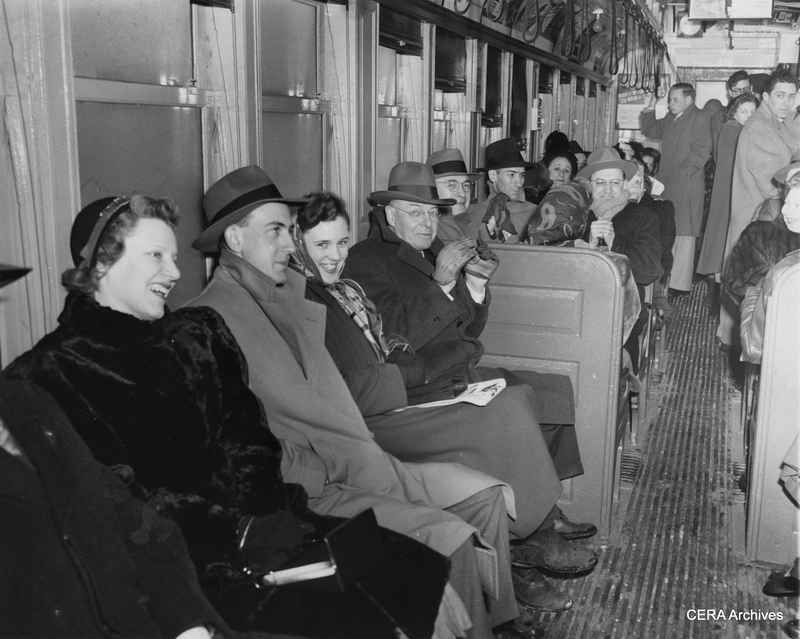 September 22, 1947 – “End Subway Hunt. The lost is found! Armed with steel claw, crane strikes pay dirt after three swings and locates remains of unused 200-foot tunnel in river near Congress st. Tube will be sealed to prevent interference with new Congress st. subway.” (Photographer unknown) What tunnel was this? 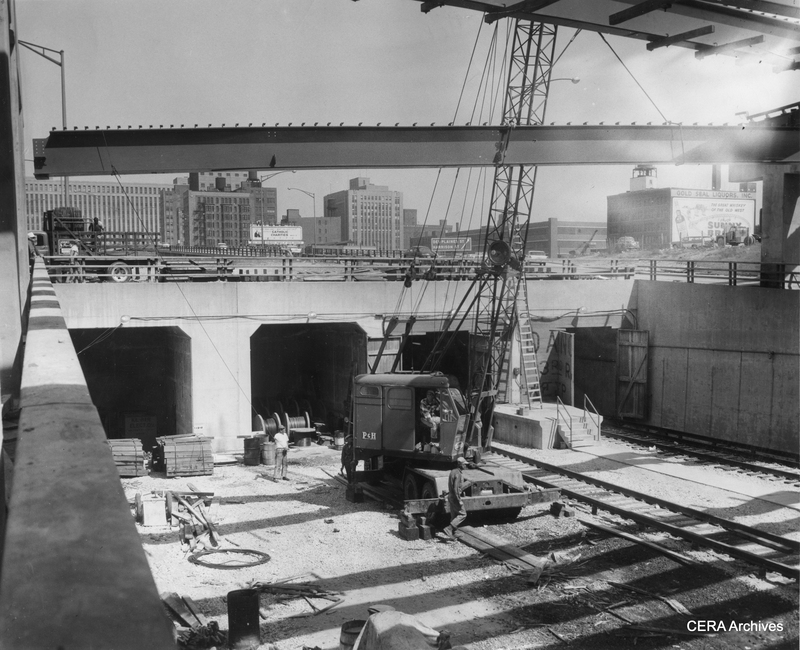 While the Dearborn-Milwaukee subway was said to be “80% completed” in 1942, when construction was halted due to WWII materials shortages (including steel subway cars), “phase one” of Chicago’s second subway ended abruptly at Dearborn and Congress. 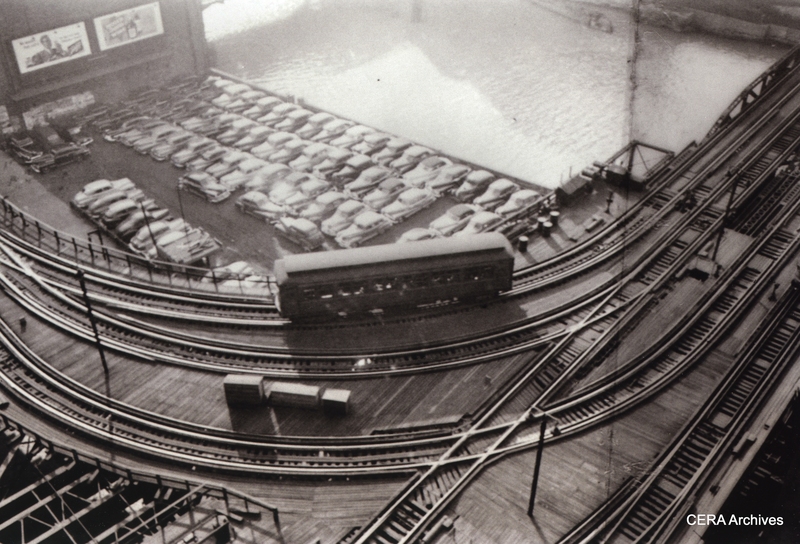 Phase two, which did not start until after WWII, brought the subway west along Congress street, under the Chicago River and the old Main Post Office, to emerge near Halsted and run in the highway median. 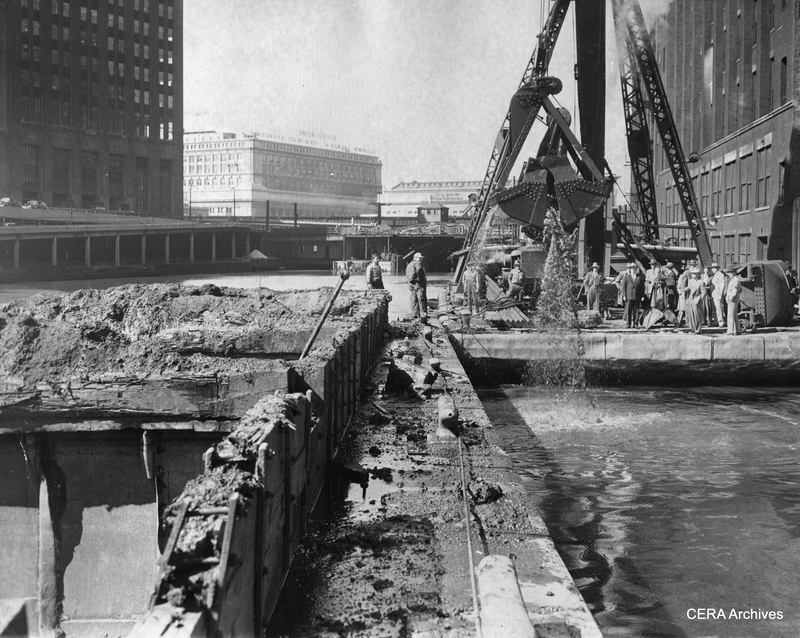 The subway opened as far as LaSalle street in 1951, and under the river starting on June 22, 1958. 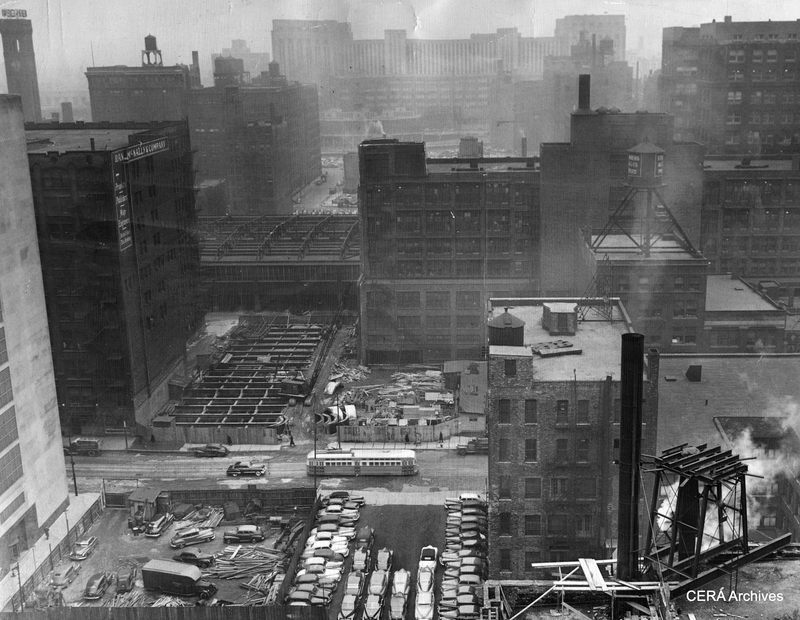 March 11, 1949 – “Land that once was congested with Loop skyscrapers appears now as a deep cut through the Loop looking west from a building on Dearborn st. The new superhighway, eight lanes wide, will pass under the LaSalle st. station tracks, over the river and through the arcade in the Post Office (background). 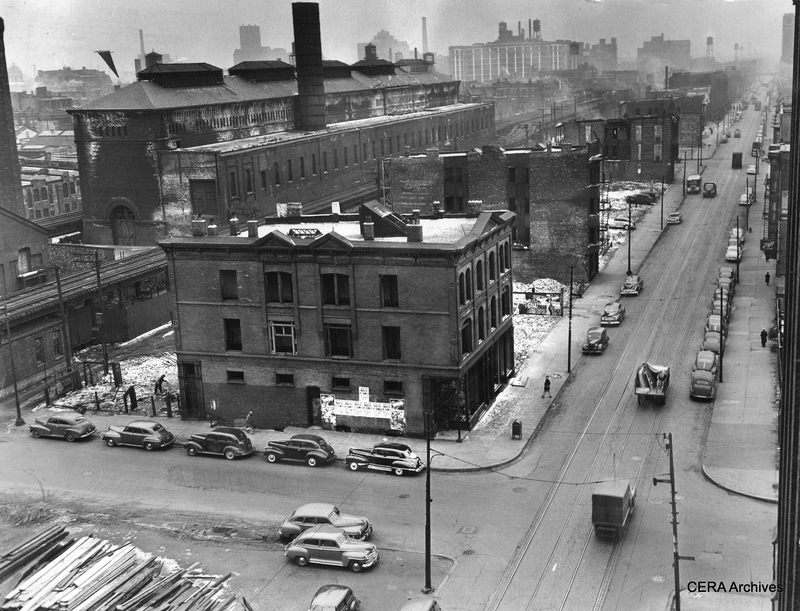 The cleared site in the immediate foreground once was the location of the 13-story Monon building, since razed by the Dept. of Subways and Superhighways. (Unknown Photographer) Note the PCC streetcar. 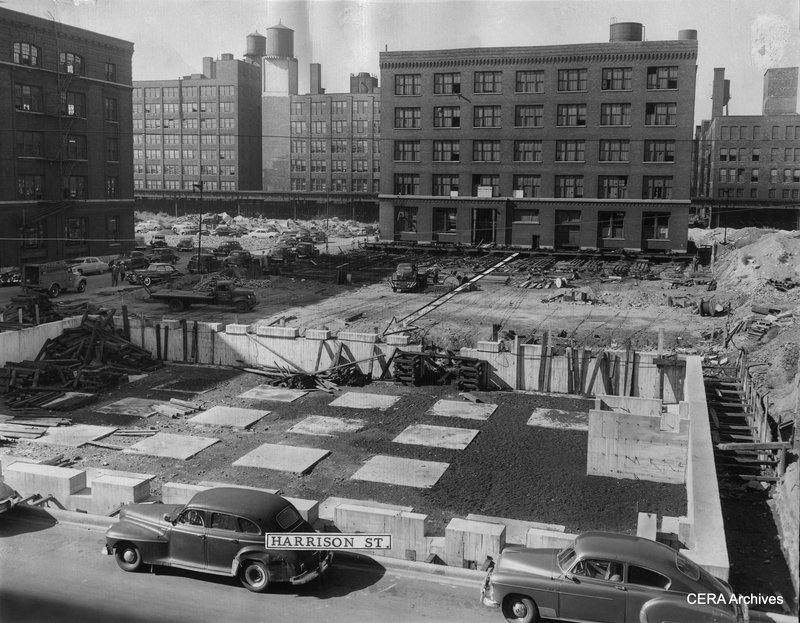 September 2, 1949 – “Arrow indicates path in which five-story building is being moved from Congress and Peoria sts. to its new foundation (foreground) at Harrison and Peoria sts. 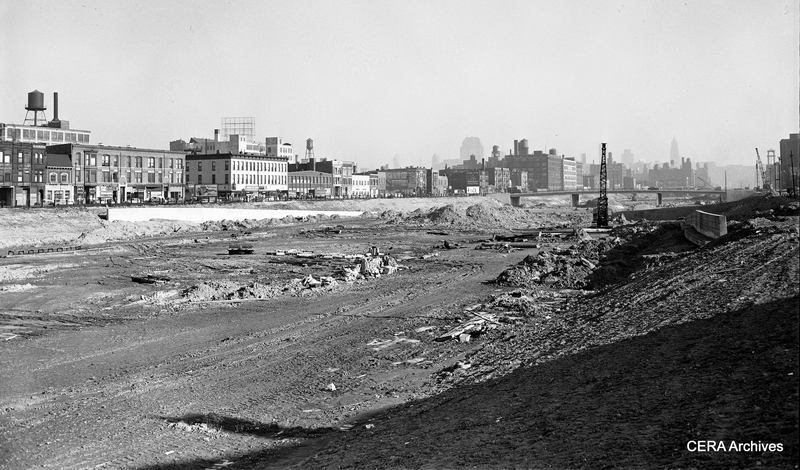 to make way for Congress st. superhighway.” (Photographer unknown) The Garfield Park “L” is visible in the background. 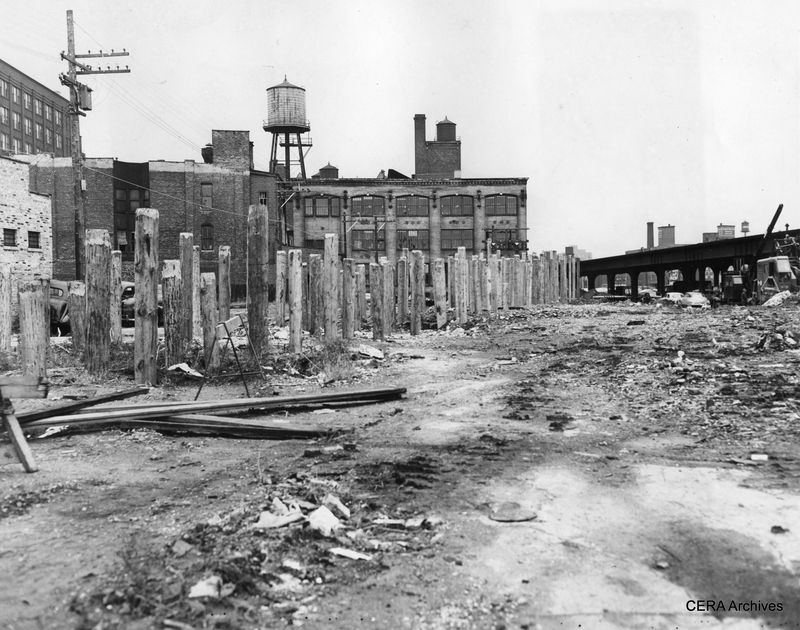 September 24, 1951 – “Going ahead with plans for shunting Aurora & Elgin trains and elevated trains to streetcar tracks in Van Buren, between Racine and Sacramento blvd., wooden pilings are driven to support structure bringing the tracks to street level.” (Photographer unknown) As we know now, CA&E refused to use the Van Buren street-level trackage. Calling it “streetcar” trackage was a bit of a stretch, since ultimately third rail was used and the right-of-way fenced off from traffic. However, calling it that may have been the means used to justify operating trains without crossing gate protection. May 8, 1952 – “Looking west from Wood along the way of the (Congress) Superhighway.” (Photo by Joe Kordick) This image was taken just prior to one in part 4 of this series. 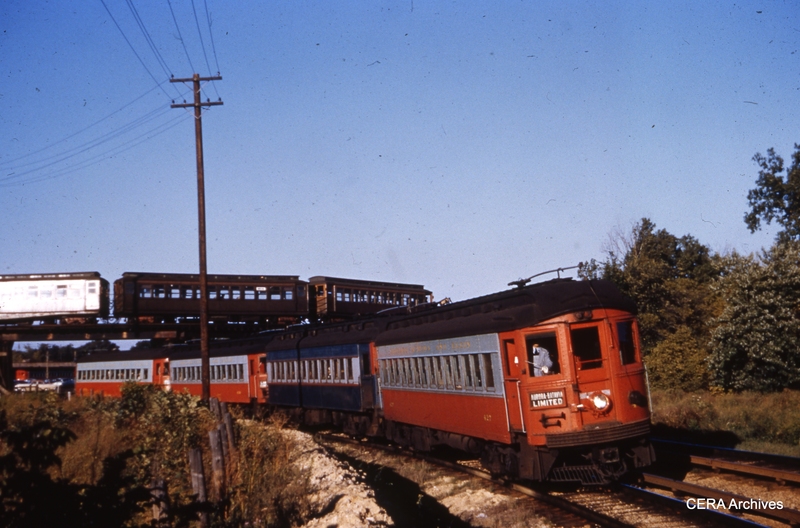 A two-car Garfield Park “L” train stops at the Ogden station, closely shadowed by a three-car CA&E train, which will also stop there to discharge passengers (instead of at Marshfield, which CTA considered a bottleneck). 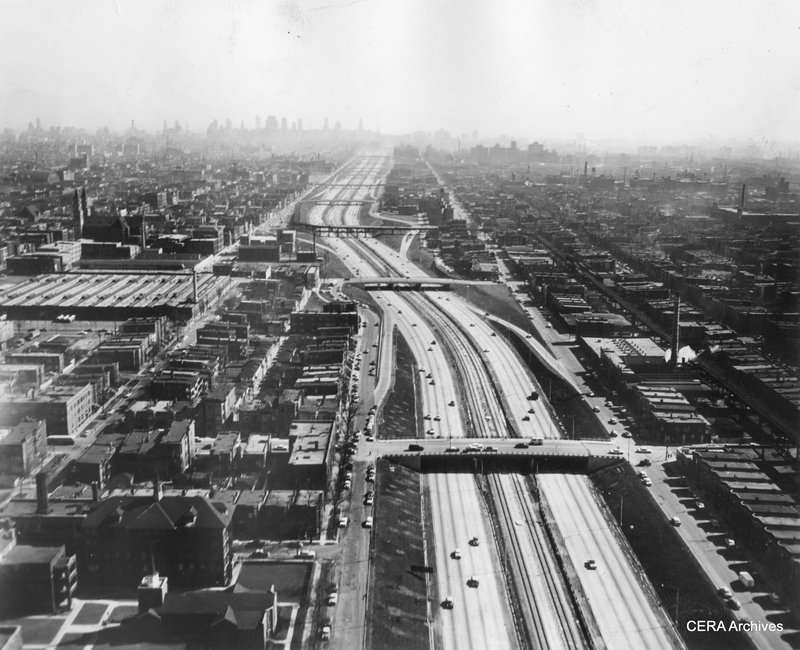 December 9, 1957 – “Congress Expy. 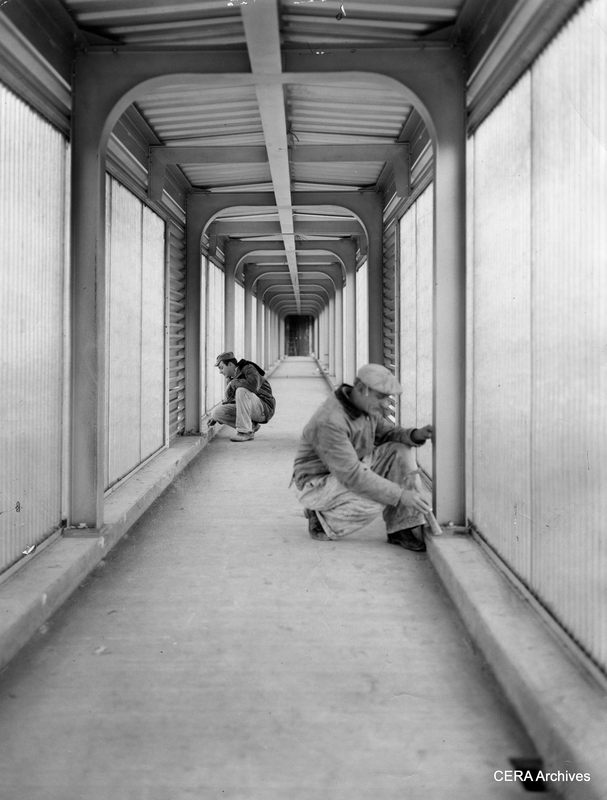 and Cicero: Dale Mueller, tile setters’ helper and Tom Shue, tile setter, work on the inside of the ramp that leads to station.” (Photo by Knefel) The full-length fiberglass panels on these station ramps soon became a problem, since they shielded anyone in the tunnel from view and were considered havens for crime. Eventually they were partially removed. 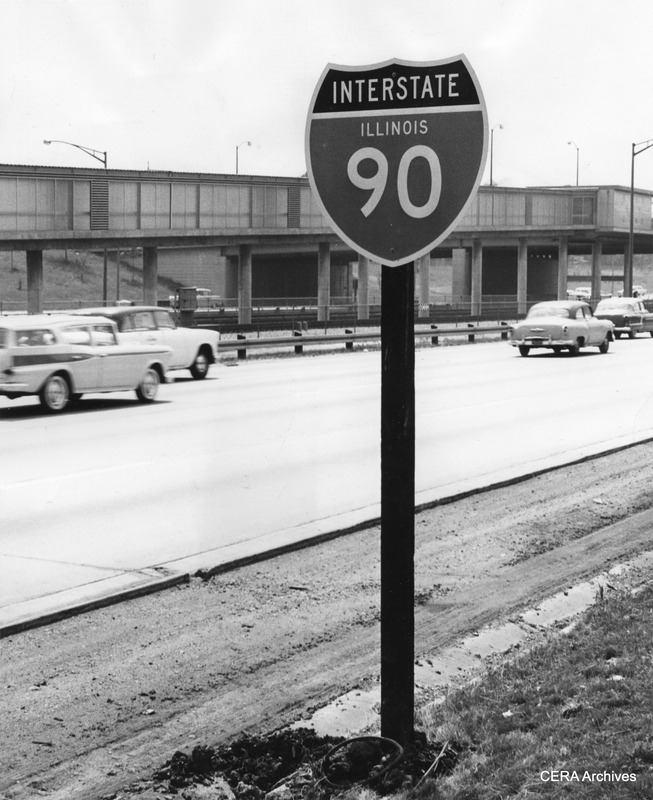 June 5, 1959 – “New sign on the Congress Street expressway on the west bound side.” (Photo by Luther Joseph) The Congress (now Eisenhower) expressway was planned before the Interstate Highway System, but eventually became part of it. I did what you said to do, still can’t find parts 1,2,&3. You should be able to find these using the search window on the blog’s home page (www.cerablog.com). how that transformation was effected? Thanks for writing. The old Garfield Park “L” crossed the expressway footprint in three places- Sacramento, Kostner, and Lotus (locations approximate). 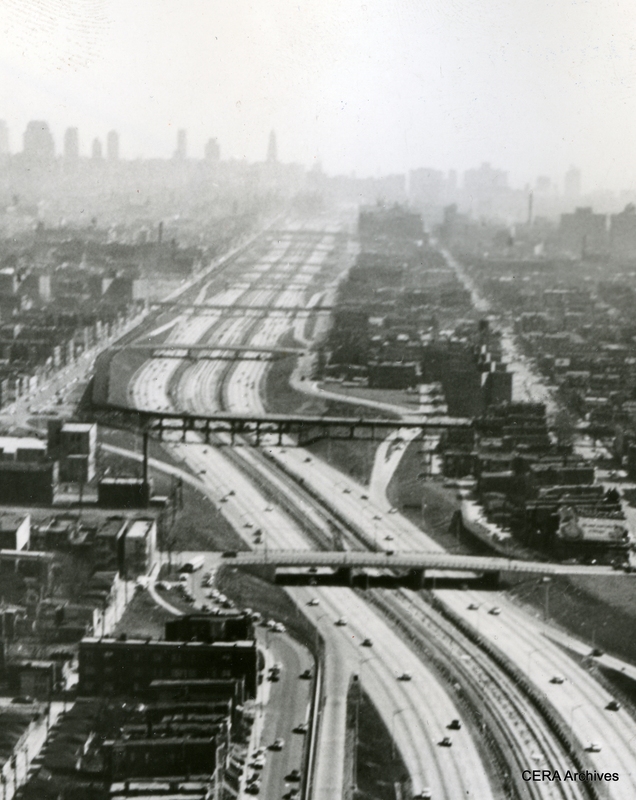 Between Lotus and Kostner, the “L” was slightly north of where the expressway is. Between Kostner and Sacramento, it was slightly to the south. East of Sacramento, it ran in more or less the middle of the highway. 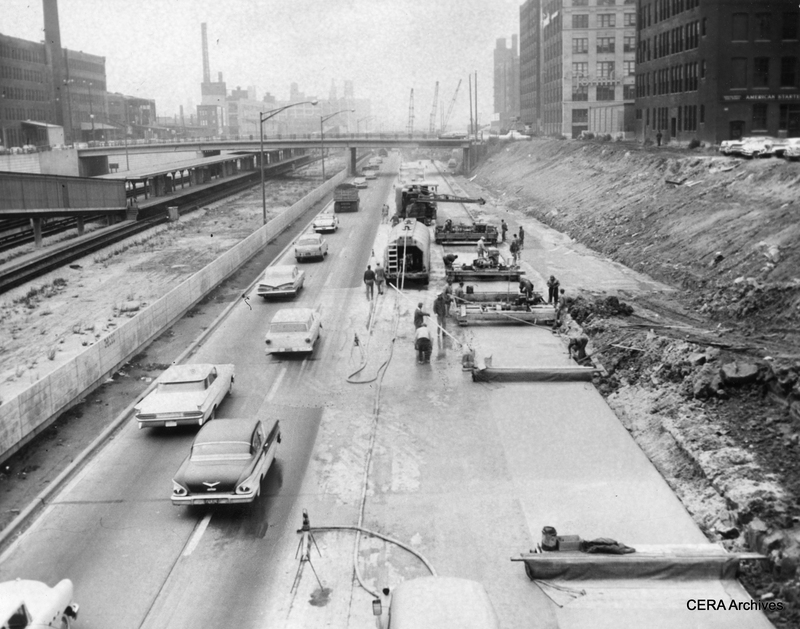 The temporary right-of-way on Van Buren covered the portion where the Garfield line and the expressway were in the same location. They only relocated the “L” where absolutely necessary. This was between Sacramento and Aberdeen. At that point, there was a ramp going back up to the “L”, which was then slightly north of the highway for a few blocks before veering off again to the north. 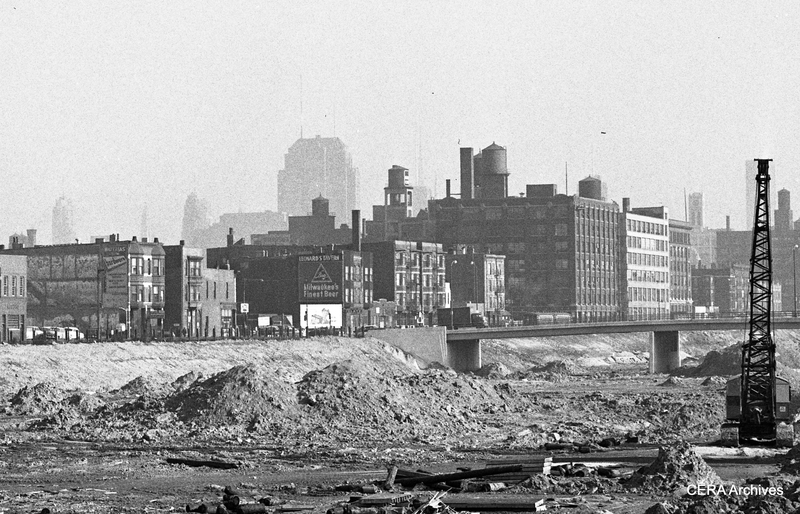 This section west of the Chicago River was largely torn down in 1959, once the Congress median line opened. Parts of the “L” east of the river were not removed until 1964. I am sure we will have a part 6 in this series, since there are still many great photos we haven’t posted yet. Thank you so much for your prompt reply. I was able to follow your directions on a current map with no problem. 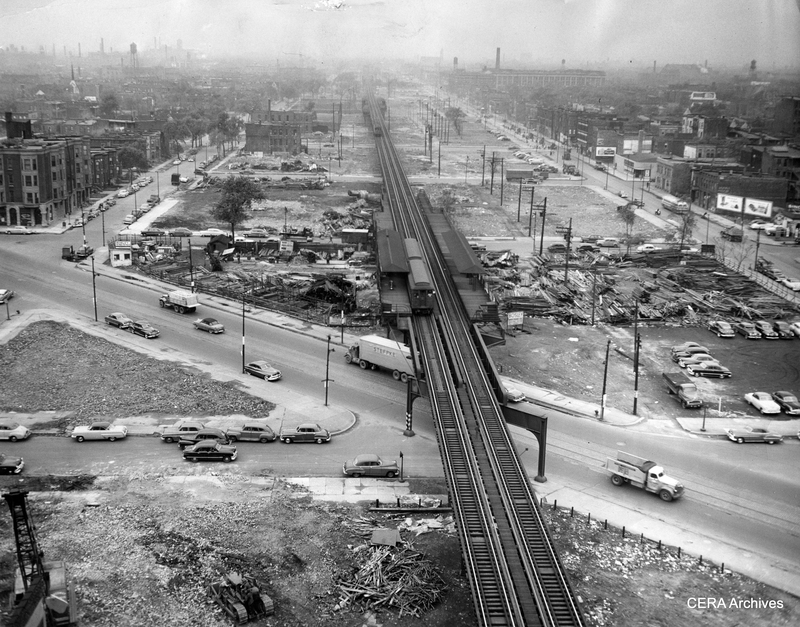 Would there not, however, have to have been one more crossing between Desplaines and, say, Beloit Ave, since, I think, the Desplaines Station was to the north of the expressway? Yes, it would have crossed there also, at more or less the same place it crosses now. 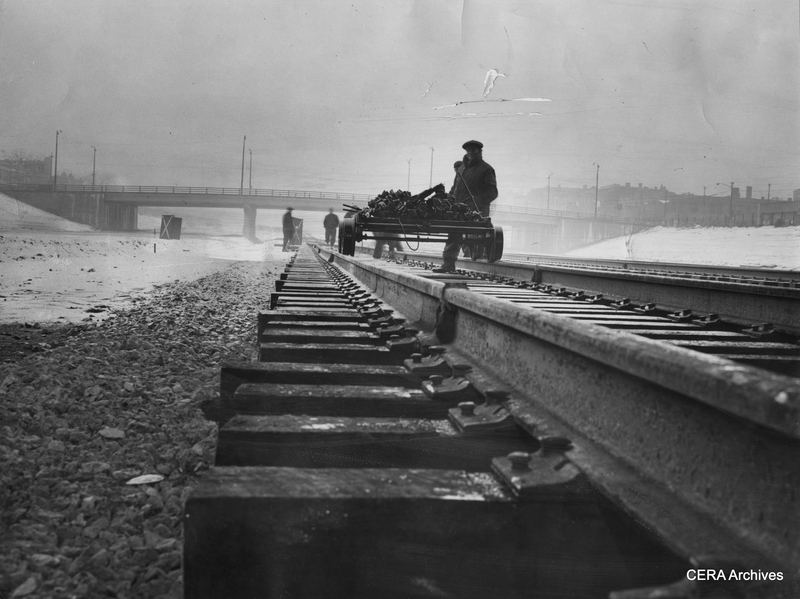 Before the expressway was built, this crossing was at grade. 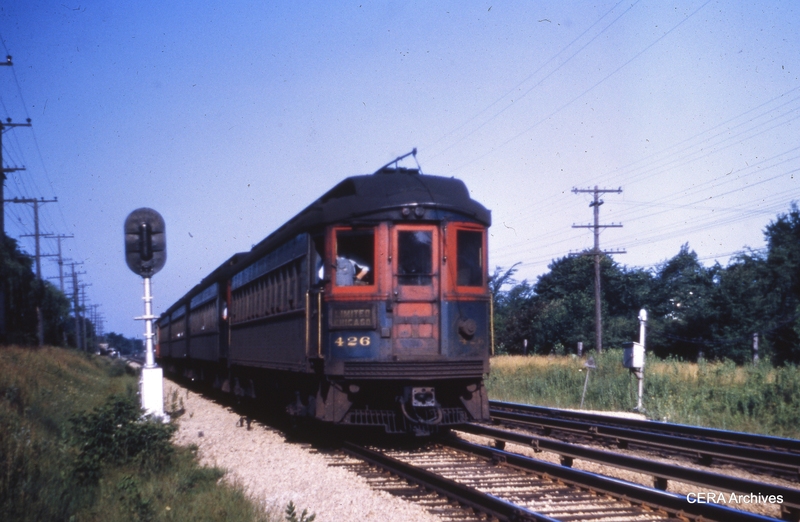 Everything west of Laramie was CA&E r-o-w, and the CTA, CRT and its predecessor company the Met had trackage rights.